Matcon Limited (Matcon IBC ) recently welcomed their global sales team and network of agents to a training conference at their new Global Headquarters in Evesham, Worcestershire. The two-day conference was attended by over 30 executives from all major continents around the world. There is growing realisation within the business that Matcon systems are ideally suited to helping customers become ‘lean’ and more efficient in their manufacturing operations. This has resulted in an unprecedented amount of product development within Matcon, as well as the introduction of new concepts, which are simple technically but do require detailed descriptions and discussions at application level. The conference was organised to educate the sales executives and agents with the latest information on Matcon IBC equipment and process modules so that they were better equipped to communicate the right knowledge to existing as well as potential customers. 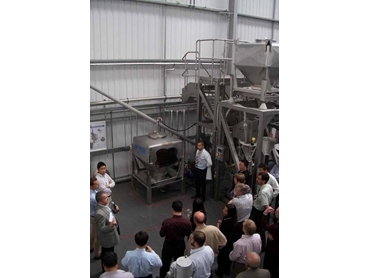 The comprehensive conference agenda included interactive workshops, a guided factory tour and ‘live’ demonstrations of Matcon IBC equipment and ‘process modules’ at Matcon’s brand new test plant. Dave Newell, Business Development Director of Matcon Pacific is now available to offer consultation on lean powder processing solutions for customers.